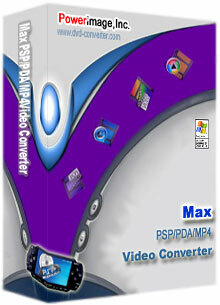 Max PSP PDA MP4 Video Converter is super-powerful and easy to use software to convert Video to PSP, video to PDA, video to MP4 formats, which can convert AVI (DivX, XviD...), MOV (QuickTime), MPEG (MPEG-1, MPEG-2), MPG, WMV/ASF, WMA, DAT, MP4, 3GP…to PSP PDA MP4 formats. Max PSP PDA MP4 Video Converter enables you to put your favor move and love music on PSP,mp4 player,personal digital assistant.In this way you can enjoying it without the restrict of time and place. Support Input file format of MP4 MOV to PSP PDA MP4.